Today we are in luck! 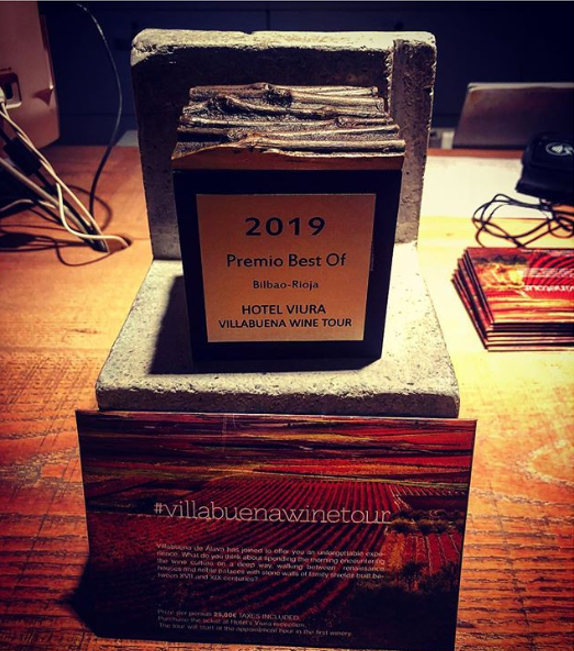 The Villabuena wine tour has received one of the Best of Bilbao-Rioja 2019 Wine Tourism Awards that were given last night in Ollauri by the international network of Great Wine Capitals. We want to thank the jury and the organization for this award, fruit of the collaboration of a village with fragrance of wine, a village with more wineries per inhabitant. A project that we all feel really proud of it, which includes 1 hotel, 1 vinoteca and 11 different wineries. And last we also want to congratulate the rest of the winners awarded and all the projects presented. Now we have to continue working with enthusiasm and above all continue to work together for our village, our wineries and our wines with the aim of sharing all this with all those people who enjoy wine as we do.